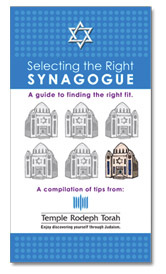 Learn how to choose a synagogue, how they differ and what questions you should be asking when comparing different congregations. Selecting a synagogue is one of the most important decisions you can make for you and your family. Synagogue membership is not inexpensive. Just as you research other large purchases, you should take some time to investigate different synagogues. Download this eBook now for clear guidance about this important process.